Happy Tuesday! All during the month of October, Splitcoaststampers is sponsoring Hope You Can Cling To to benefit the MD Anderson Cancer Center. A different challenge is being presented each day of the month. I’m excited today because it’s my day to host the challenge! My challenge is called “Get Inked”, and it’s dedicated to my mom and to other cancer patients who have received, or who are currently receiving, radiation treatment. In preparation for radiation treatments, frequently the affected area of the patient’s body is tattooed with dots so that the technicians can line up the machines accurately each day of treatment. So my challenge is to use a liquid ink to create dots or spots somewhere on your artwork. You can drip or spray the ink, and your inked piece can be used as part of your main focal point or as a background. The choices are up to you! The card I’m sharing today features some inked leaves. The leaves are from a digital stamp set. I printed them and then watercolored them with ink from stamp pad refills. Once the leaves were dry, I dipped a paintbrush into a small pool of ink, held the brush over the leaves, and tapped the brush so the ink would splatter randomly onto the leaves. I repeated this process with several different colors of ink. 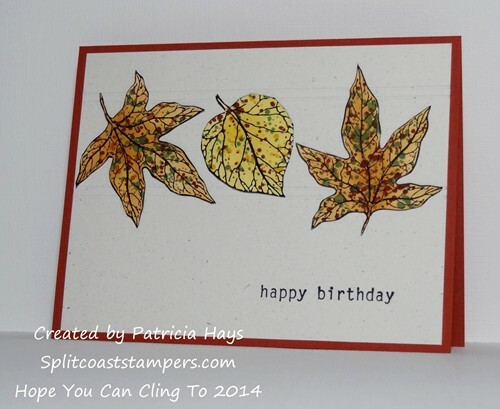 For the background of the card, I scored double lines across the cardstock and used them to frame the leaves. I hope you’ll join in the Hope You Can Cling To challenges at Splitcoaststampers.com and help bring cheer to the cancer patients at MD Anderson! Thanks for stopping by today!